Nanofibers are characterized by high specific surface area due to very tiny diameter from tens nanometer to micrometer. Thanks to this properties the nanofibers layers are employed in technical applications (filters, sensors, separators in battery) and also in medical applications (preparation of replacement organs, vascular transplants, target drugs delivery). The prior material for preparation of nanofibers is synthetic or nature polymer in form polymer solution or melt. Currently, there are several ways to prepare nanofibers layer nevertheless the electrospinning process is most utilized. In the process a high electric field is applied on the drop of polymer solution, from which the viscoelastic jet is emitted. The charged polymer jet is drawing into tiny diameter during traveling to the grounded collector at the same time the solvent is evaporated. The electrospinning is affected by a number of the materials and process factors. One of the most important material parameter is rheological properties of polymer solution which are intensively studied and optimized. 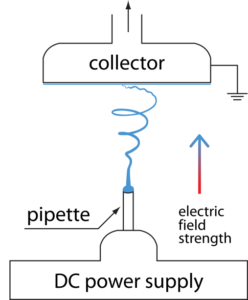 The device to preparation of nanofibers layer is composed from three basic components: spinneret (metal stick, needle, and roller), collector (static, rotating) and power supply. The electrospinning is influenced by voltage applied to polymer solution or melt. Due to a high voltage (10-70 kV), the polymer droplet become statically charged and the surface is disturbed into a conical shape so called Taylor cone. When the repulsive electrostatic force overcomes the surface tension the viscoelastic jet is ejected from the tip of the Taylor cone and travels towards the grounded collector. As the charged jet travels to the grounded collector its diameter is elongated, thinned and solidified. The polymer nanofibers are collected in form of layers (non-woven textile) randomly or arranged in one direction depending on the type of collector. The design and construction of the electrospinning apparatus led to the formation of the industrial machine on the production of the nanofibrous layers. Polymer – It is possible use synthetic and nature polymer, also their blends or combinations. Molecular weight, distribution of molecular weights, topology of polymer affected resulting visage of the nanofibers. The required properties of the nanofibers for different application are derived from the polymer used. Solvent – the role of the solvents is significant and influences the shape of nanofibers. It can be utilize good and poor solvents or their combinations. The blends of solvents are used for preparation of the porous nanofibers. More volatile solvents evaporate quicker which reduce the working distance. Polymer solution – Properties of the solvents (volatility, permittivity, surface tension) influence complex system – polymer solution. The most important properties are rheological parameters, surface tension, and conductivity. Into polymer solution can be incorporated some others additives (organic or inorganic type) which can improve resulting properties (antibacterial, magnetic, tailored wettability etc.) of the nanofibers. Voltage – The electric voltage required to produce a jet must have a higher potential than surface energy of the solution. A higher applied voltage provides faster acceleration of emitted jet and all process. Spinning distance – The distance between the spinneret and the collector directly affect the deposition time, evaporation rate and whipping or instability regions. The spinning distance is in the rage of 5 to 40 cm. Environment – Ambient temperature and humidity owing to their influence on the solvent evaporation process and the resultant fiber morphology. Morphology of fibers (shape and diameter) is influenced by material and process parameters during the electrospinnig process. In consideration of shape, the nanofibers can be circular, flat (ribbon), porous, bi-component, hollow etc. The fiber diameter affects the specific surface area but also the mechanical properties. Generally, the mechanical properties of nanofibrous layer are very poor and from this purpose the nanofibers are deposited on the non-woven textile prepared different technology. The carbon nanofibers are prepared by carbonization of polymeric nanofibers. A highly porous web and large surface-to-volume ratio of nanofibres have found applications in many medical or technical areas. Currently, using nanotechnology for the preparation of membranes and filters containing nanofibrous layer is indispensable in many industrial areas. Filters with nanofibrous layer have higher filtration efficiency, chemical resistance, adsorption capacity and may also serve to temporarily capture of functional groups or biochemical. Nanofibrous membranes are used to acquire drinking water from geothermal springs but also during the desalination process. Other examples of the application of nanofibrous layer include anti-allergenic fabrics where the nanofiber layer serves as barrier against dust mites and allergens. Antiviral breathing masks with a nanofiber layer against dangerous viruses, fungi and other harmful substances. Plasters containing nanofibers membranes with a combination of hyaluronic acid accelerate wound healing and prevent the penetration of bacteria and impurities into the skin. Future applications of nanofibrous layers in healthcare include, for example, the production of 3D structures as scaffolding for cell growth and the preparation of replacement organs, bones, cartilage, and muscles. Nanofibers will be used to regenerate the skin and nerve tissue. The rheological properties (viscosity, viscoelasticity) of polymer solutions are one of the most important material parameters influencing the formation of the nanofibrous layer. Particularly when nanoparticles of active substances (hydrophobic, hydrophilic, antibacterial, magnetic nanoparticles) are incorporated into the polymer solutions they change their flow properties and consequently also the quality of the nanofibrous layer. The polymer solution's viscosity affects initialization of the process and then the diameter of the resulting nanofibres. The viscoelasticity of the polymer solution contributes to the reinforcement of the jet during drawing and depositing the fibers on the collector. In recent years, research at the Institute of Hydrodynamics of the Academy of Sciences of the Czech Republic has significantly contributed to the elucidation of the connection between the flow properties of polymer solutions and nanofibers. In particular, the mechanism of interaction of additives with the polymer in the solution and the influence of rheological properties on the morphology of nanofibres are investigated. The research also focuses on the antimicrobial properties of nanofibres that prevent the growth of biofilm on water filters. Peer, P., Polášková, M., Šuly, P. Rheology of Polyvinyl Butyral Solution Containing Fumed Silica in Correlation with Electrospinning. Chinese Journal Of Polymer Science. 36(6), 742-748. Sedlaříková, J., Doležalová, M., Egner, P., Pavlačková, J., Krejčí, J., Rudolf, O., Peer, P., (2017). Effect of oregano and marjoram essential oils on the physical and antimicrobial properties of chitosan based systems. International Journal Of Polymer Science. 2017, 2593863. Peer, P., Filip, P., (2017). Nanofibrous web quality in dependence on the preparation of poly(ethylene oxide) aqueous solutions. The Journal of The Textile Institute. 108(12), 2021-2026. Peer, P., Filip, P., Polášková, M., Kucharczyk, P., Pavlínek, V., (2016). The influence of sonication of poly(ethylene oxide) solutions to the quality of resulting electrospun nanofibrous mats. Polymer Degradation And Stability. 126, 101-106.